8 Responses to Science Tank! WANT! So…if they’re underwater, why does the tank have wings instead of fins or propellers, and why do our heroes not have any kind of masks on (not to mention the fact that they’re holding a conversation)? Invaders? You two don’t live under the sea. You’re the invaders, they’re probably coming to take you back to the surface where you belong. Are those our only two options of who they could be really? That’s so random, why not a spanish platapus? Thank you, TOOL! That was exactly my first thought as well. I almost went with a headline of “Great moments in false dichotomies” but I thought that was too esoteric. But that was what made me clip the panel in the first place. “Why not a Spanish platypus” would have been stellar, wish I’d have thought of that. That show is pretty good. 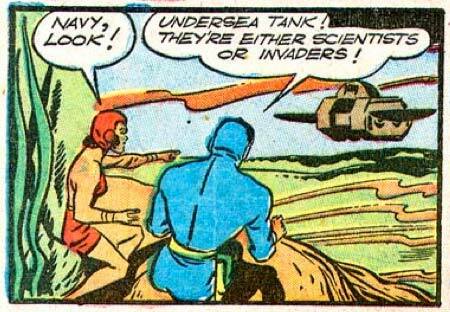 As for how they’re even holding that conversation: maybe they could breathe underwater or something like Aquaman.